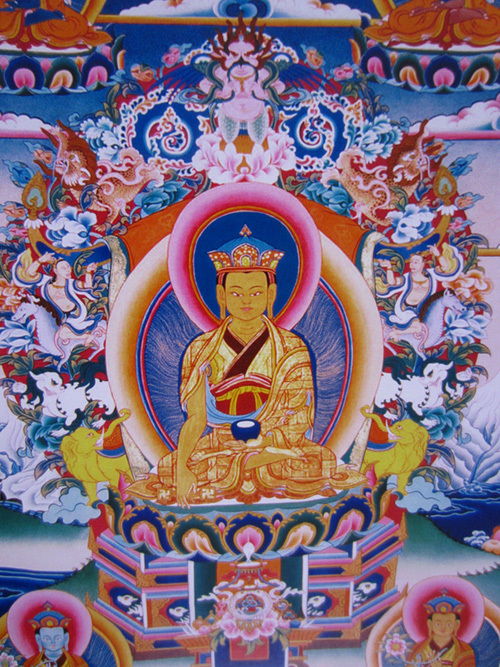 Because Lord Tönpa Shenrap possessed complete awareness of the suffering of cyclic existence, and out of compassion for sentient beings, he demonstrated a skillful method for sentient beings to release themselves from suffering and misery and to attain liberation. This method was the path of renunciation. Being an enlightened being, he did not need to do this for himself but chose to demonstrate this path as an example for his followers of Yungdrung Bön. Therefore, at the age of 31 (according to shen years which equal 3,100 human years), he announced to his family and disciples that he would leave worldly activities behind and devote himself completely to the path of renunciation. He removed his jewelry and silk robes, and then cut off his hair with a sword. Leaving behind all of his possessions, he went to a higher realm in order to receive ordination from a disciple of the Enlightened One of the previous eon. Returning to earth, he devoted himself to the practice of fasting, disciplined behavior, and teaching the Four Thoughts that Turn the Mind to various groups of demons. After this, he retired to the nine-storied yungdrung mountain in order to practice in solitude. Upon entering into the path of renunciation, many of his disciples abandoned him and his teachings and returned to their worldly activities. However, a few disciples of greater capacity remained with him on the mountain, and to them he taught the highest view, the Great Perfection. Posted on June 24, 2017, in Tibetan Culture & History, Tonpa Shenrap, Uncategorized. Bookmark the permalink. Leave a comment.